Germany is repatriating its gold reserves from the New York Federal Reserve. This decision has created a frenzy in the gold market. But that is just the tip of the iceberg. According to the NY Fed, there are (2012) approximately 530,000 gold bars, with a combined weight of circa 6,700 metric tonnes stashed away in the Fed’s Lower Manhattan vaults. These are official figures which are impossible to verify. The gold is stored in the fifth sub-floor of the New York Fed building on Liberty Street. The vaults on the bedrock of Manhattan Island are located 80 feet below street level. Each of the 530,000 gold bars weighs 400 troy ounces, or about 12.44kg. At today’s market value of approximately US$1700 dollars a troy ounce, the New York Fed has within its vaults a multi-billion dollar treasure trove. The 400-ounce gold bar is quoted at $677,640. Each metric tonne of gold is worth approximately $55 million. The total value of the New York Federal Reserve’s gold bullion trove of 6700 tonnes is a staggering $368.5 billion. The gold is in “safe-keeping” on behalf of more than 60 sovereign countries and a few organizations. Close to 98 per cent of the gold bullion stored in the NY Fed’s lower Manhattan vaults, according to the Fed, belongs to central banks of foreign countries. 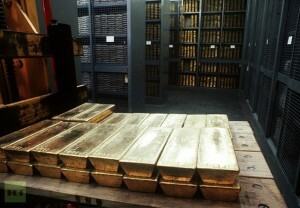 Germany’s central bank owns a total of 3400 tonnes of gold. 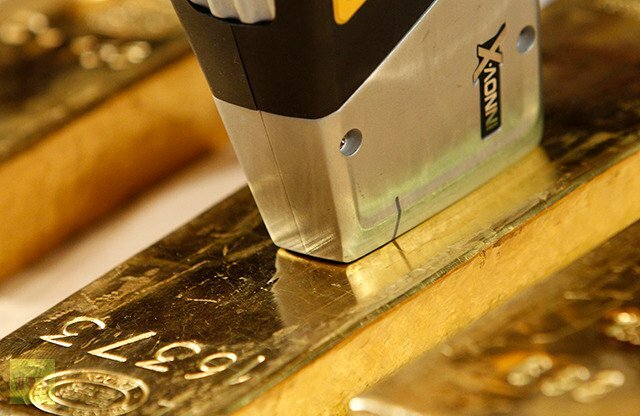 According to recent reports, a staggering 69 per cent of its gold bullion bars (namely 2346 tonnes) are held in custody at the New York Federal Reserve, the Bank of England and the Banque de France. The NY Federal Reserve Bank holds in custody 1536 metric tonnes of gold owned by the Bundesbank of the Federal Republic of Germany, 22.9 per cent of its total gold holdings in custody (6700 tonnes). 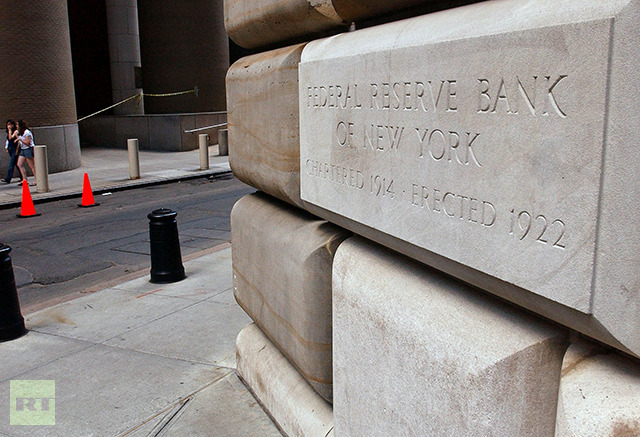 The Bundesbank has announced that it will repatriate “all of its 374 metric tonnes stored at the Banque de France (11 per cent of its total reserves), and 300 metric tonnes held in the vault of the New York Fed, reducing its share in the US from 45 per cent to 37 per cent.” . Two other European countries, namely Italy and the Netherlands, have significant yet undisclosed gold bullion reserves held in custody in the vaults of the NY Federal Reserve Bank. There are no immediate plans to repatriate this bullion. While the NY Federal Reserve Bank does not actually own the gold, it is guardian of a multibillion-dollar gold treasure, which indelibly provides ‘collateral’ (at virtually no cost) as well as ‘leverage’ in its multibillion-dollar central banking operations, often at the expense of its European partners. The New York Fed’s gold vault on the basement floor of its main office building in Manhattan provides account holders with a secure location to store their monetary gold reserves. None of the gold stored in the vault belongs to the New York Fed or the Federal Reserve System. The New York Fed acts as the guardian and custodian of the gold riches on behalf of account holders, which include the US government, foreign governments, other central banks and official international organizations. In other words, the Fed runs its operation ‘with other people’s gold’, using this huge treasure as ‘collateral’ to back its various financial undertakings. Foreign countries around the world were pressured after World War II into depositing their gold reserves, not within the vaults of their own central banks, but in that of the world’s foremost imperial power. For many countries, part of the US dollar proceeds of commodities sold to the US, were converted into gold at 32 dollars an ounce (1946-71) and then ‘returned’ – so to speak – to the US for deposit in the vaults of the NY Federal Reserve. Germany’s decision to repatriate part of its gold has sent a cold shiver into the gold and forex markets. Are these German bullion reserves held in the vaults of Lower Manhattan ‘separate’ or are they part of the Federal Reserve’s fungible ‘big pot’ of gold assets. Does the New York Federal Reserve Bank have “Fungible Gold Assets to the Degree Claimed”? Could the Fed reasonably handle a process of homeland repatriation of gold assets initiated by several countries simultaneously? According to the Fed, there are 122 separate gold accounts mainly held by the central banks of foreign countries, as well as a few organizations including the International Monetary Fund. Following the verification process, the gold is moved to one of the vault’s 122 compartments, where each compartment contains gold held by a single account holder. In rare cases, small deposits are placed on separately numbered spaces on shelves in a ‘library’ compartment shared by several account holders. Each compartment is secured by a padlock, two combination locks and an auditor’s seal. Compartments are numbered rather than named to maintain confidentiality of the account holders. The New York Fed does not indicate in any of its reports, including its annual financial statements, the names of the countries and account holders. Most of the 122 accounts are held by the central banks of sovereign countries, which in addition to their gold accounts have statutory agreements with the NY Federal Reserve. America’s Unipolar World hinges on sustaining the US dollar as a global reserve currency. US hegemony in monetary matters is supported by the custody in the USA of gold bullion reserves on behalf of more than 60 countries. Instead of gold bullion, national central banks (with the exception of the US) hold US dollar paper instruments as ‘reserves’. Gold reserves under national jurisdiction are central to establishing sovereignty in monetary policy, without depending on the Federal Reserve which holds a nation’s gold bullion in safe-keeping in its Lower Manhattan vault. National sovereignty requires the repatriation of the gold bullion deposited in custody with the NY Fed. The leverage and collateral in all monetary transactions largely accrues to the NY Federal Reserve Bank rather than to the owners of the bullion deposited in custody. Follow the example of Germany. Repatriate your gold. In a related development, both China and Russia are dumping their US dollars and building up their gold reserves. In turn, both China and Russia have boosted domestic production of gold, a large share of which is being purchased by their central banks.